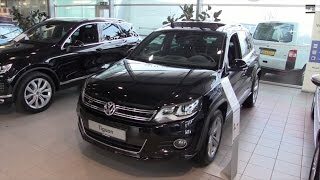 Volkswagen is showing four versions of the Tiguan including the sportier one Volkswagen Tiguan R-Line 2016. It’s the classic on-road model and a special off-road version. It is a mid level version just above the base version S and is below the versions SE and SEL. But with its sportier appearance it can do wonders in the market. 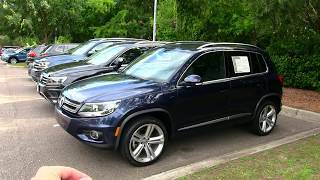 Let us have a close look at the reviews of Volkswagen Tiguan R-Line 2016 and get to know more about the features it contains. The interior of Volkswagen Tiguan R-Line 2016 contains upgraded materials and entirely a new layout which gives the crossover more functionality and style. The interior of the Tiguan R-Line is comfortable and roomy. The steering wheel of R-Line is leather wrapped, multifunction, telescopic and is height adjustable to accommodate drivers of just about any size.In addition there is a power sunroof, leather upholstery, rear parking sensors, dual-zone automatic climate control, memory for driver settings, GPS navigation, and a 9-speaker Fender premium audio system. There is a infotainment system that is positioned high in the centre stack and angled toward the driver. At the back there is a plenty of space and supportive seats that are 40/20/40 split-folding with sliding bench adjustment. These all features make the interior of R-Line enormous. The exterior of Volkswagen Tiguan R-Line 2016 has a sporty look. It is basically smaller than the other four versions, but is a complete power pack. It includes 19-inch alloy wheels, a sport-tuned suspension, a roof rack, and a rear spoiler, and a rear-view camera. The front end of the Tiguan has a wider stance due to which there is an increase in the physical width of radiator grille and headlights. The Tiguan is the first Volkswagen SUV to be equipped with dual LED headlights. There are larger wheel arches, a special rear bumper and side skirts, R-line badging, and metal door sill scuff plates and pedals. A rear spoiler completes the look. The model R-Line is enhanced with standard features all over. 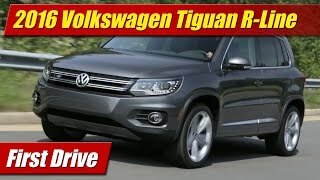 Volkswagen Tiguan R-Line 2016 is powered from a 2.0-liter 4-cylinder turbocharged engine that has just the slightest bit of lag when accelerating. Power of the model is 200 horsepower and 207 lb-ft of torque is paired to a six-speed automatic transmission.